Posted by admin in Fluoxymesterone Side Effects, Fluoxymesterone Info on November 29, 2017 . 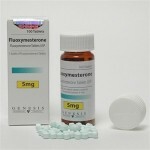 Fluoxymesterone – is tableted anabolic steroid. This drug has a relatively weak anabolic effect and at the same time has a strong androgenic effect. Athletes taking fluoxymesterone, to improve their performance and increase the power density of the muscles. The total weight of the athlete does not change. Halotestin has a specific activity, and for this reason it is a favorite drug of strength athletes, who want to remain in his weight class, boxers and other athletes in combat sports. Fluoxymesterone take before the competition. Unfortunately, this drug has a high toxic effects on the liver. Halotestin – oral steroid which was introduced on the market by Upjohn in 1957. The active substance fluoxymesterone (Halotestin) is essentially a previous methyltestosterone, which is due to changes in the chemical structure, was made much more androgenic than just testosterone. Anabolic Halotestin same effect is quite small in comparison to the androgen.